CAPE TOWN, South Africa (CNS) — The Catholic Church in South Africa has called on faith and other communities to use their influence to stop xenophobic violence and urged help for its victims. Attacks on foreign nationals have left at least seven people dead, more than 5,000 displaced, and shops looted and razed. They started in Durban in early April and spread to other parts of the country. “As a pastor, as a South African and as a resident of Durban, I am utterly shocked and filled with shame by the violence and intolerance that has overtaken our beloved city,” Cardinal Wilfrid F. Napier of Durban said in an April 17 statement. The xenophobic violence “is deeply disturbing and shamefully embarrassing for the people of South Africa and betrays the whole African continent,” the Johannesburg-based Jesuit Institute said in a statement. The Zulu king, Goodwill Zwelithini, who called for foreigners to pack their bags and leave, has contributed to the violence through his words, it said. By failing to correct any possible misunderstanding, the king “has morally compromised himself,” it said. Noting that the perpetrators of this violence “are people who worship in our faith communities,” the Jesuits called on religious leaders to find ways of addressing this endemic problem. The fact that xenophobic violence has continued after 2008 means that the government has failed to “address this scourge through education, dialogue, and other methods of outreach,” the Jesuits said. More than 60 people were killed and more than 30,000 people were displaced in attacks on foreigners around South Africa in May 2008. In this “sad and traumatic” time, “we need to make sure that the areas in which we live are places where all feel welcome and safe,” Cardinal Napier said. “If people have fled our neighborhoods because they felt unwelcome, we need to help them to move back and rebuild their lives,” he said. “If we know people who do not share our values, we need to challenge them to a ‘conversion of heart’ in which, like the Good Samaritan, we see every person as our neighbor, especially those who are different from us,” he said. 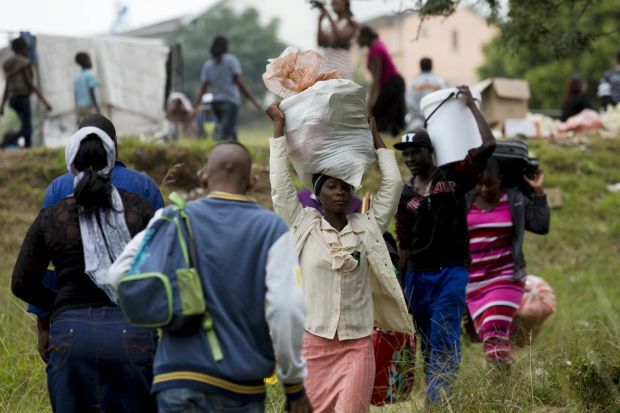 As well as financial support for displaced victims of violence, South Africa’s bishops “commit ourselves to pray to God for this situation to be resolved and to be available as agents to broker peace,” the Southern African Catholic Bishops’ Conference said. “We urge the foreigners and expatriates to avoid being involved in any unfair labor and illegal business practices,” the conference said in a statement issued by its spokesman, Archbishop William Slattery of Pretoria. Because “there are strong feelings among locals that many foreigners are here illegally and are involved in illegal activities, such as selling drugs, foreigners need to cooperate with local authorities in order to keep a good name for themselves,” Archbishop Slattery said in an April 17 telephone interview. Xenophobia “has deep roots and relates to the anger in South African society,” Father Pollitt said. “People were looking for change” when the first post-apartheid government was elected in 1994, “and they have been let down and are still living in squalor,” he said. “As church, we haven’t been speaking out against xenophobia as we should, and we could have done more” to stop its recurrence, he said. South African companies also should do their part to address xenophobia, the Jesuits said, noting that many South African companies employ foreign nationals across the continent. “The Jesuit Institute commits itself to action, with our partners and through our network, to disseminating information and promoting awareness campaigns,” the statement said. “We commit ourselves to collaborating with all people of goodwill to create a society in which all people are treated with dignity and feel welcome,” it said. Its a shame how the media choose to cover certain issues but fail to even mention other situations of even greater magnitude. It is terrible that there is xenophobic violence in SA, however nobody mentions the fact that over 10 percent of the farmers have been murdered in South Africa or how ethnic minorities have been excluded from the job market, thus 800,000 are living in squatter camps. The president of SA sang a song called kill the farmer and nobody has said anything about the uptick in farm killings after he sang the song. But the king of the Zulus calls the foreigners “lice” and the media is all over it.